Resilience is an admirable trait in people and in plants. In the plant world Helleborus stands among the very best of the irrepressible. Our low temperature may not have quite reached 1°F this week, but 2°F felt just as cold. A brief reprieve this weekend brought Sunday’s high into the 50s and when I quickly searched late in the afternoon for anything that might go into a vase this week, I had only to stop in front of the hellebores. While one clump did strike a limp posture, several other groups appeared ebullient. I collected some happy ones. On the other hand, before coming inside I checked on the more vulnerable Daphne odora ‘Aureomarginata’ (Winter daphne) that has been covered in reddish-tipped buds for weeks. Before the recent cold hit the daphnes seemed poised for a thrilling bloom time. Unfortunately in a repeat of last year, now they reveal only great distress and browning and I doubt there will be many, if any, flowers. For this week’s arrangement I chose a footed glass dish with a shallow bowl to display the flowers. I placed large black stones in the bottom and covered them with water. I trimmed the stems quite short and floated the hellebores above the rocks for a colorful Monday offering. Thanks to Cathy at Rambling In The Garden for hosting. Please visit her to see what she and others are placing In A Vase On Monday. You may be tempted to join in as well. It is fun. 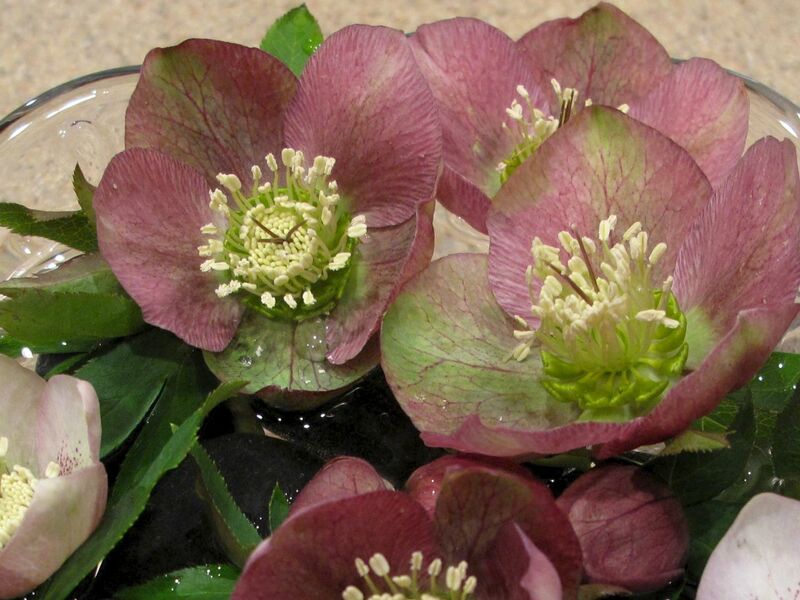 This entry was posted in garden and tagged flower arranging, flower design, garden photography, Helleborus x hybridus (Lenten rose), in a vase on monday, nature photography on February 23, 2015 by pbmgarden. As you mentioned on your blog today, gardeners are always looking to next year. I’ll have to take more care with the daphne next year. I added the stones or contrast but also to help support the flowers a bit, as the dish is a little deeper than I would normally use for floating hellebores. Seems to have worked. I love the idea of floating flowers and these are beautiful…I can’t wait for my hellebores…as soon as we melt and warm a bit mine will bloom and endure cold early spring conditions here. I don’t think we’ll know the full extent of damage until summer. I’m especially fearful for the Japanese maples, as the sap may have begun to rise in at least some. I’m sorry about your Daphne. I wonder if the bigleaf hydrangeas buds are okay, as they went by the wayside last year too. Your vase is a perfect winter offering. The use of black rocks is inspired. Regretting that I didn’t buy and plant more Hellebores last fall. What a wonderful plant. Stepheny, I always regret not getting some of the more exotic colors. Last year I’d planned a trip to Pine Knott Farms but the weather was too icy. I see they’ve extended their open weekends further into March this year. Lovely to see your hellebore flowers displayed so prettily. They certainly are resilient. Mine are in bud and I can’t wait for them to open! Such a shame about your Daphne. A reminder for me why I don’t grow one although I am tempted again and again to try. Perhaps one or two flowers will make it through. Hope it stays warmer for you now! Thanks Cathy. The hellebores cheered me up. Hope yours open soon for you to enjoy. The Daphne is hardy in my growing zone but our temperatures have been below normal this winter and last. I hope you’re right and a few of the flowers were protected enough that they will open. You have a wonderful collection of hellebores…and they are so beautifully displayed. Thanks John. I would really like to add some of the more exotic colors. Saw a photo of a gorgeous blue one I’d like to track down. Simple and positively beautiful, Susie! I’m sorry to hear about the Daphne – I know how disappointing it is to lose flowers like that, so close to reaching bloom. (We don’t get snow but our Santa Ana winds and increasingly unpredictable heatwaves wreak a similar type of havoc in the garden.) I hope the snow and cold weather abates soon! Thanks Kris. Gardening certainly has its ups and downs–maybe the daphne will surprise me yet. You must be also concerned about the lack of rain this year. It seems very serious. Your display is beautiful Susie, your temperatures are not! Sorry to read about your Daphne, Hellebores are amazing the way they put up with so much and still look lovely. I hope you have a better forecast than 2f on the way. This is definitely the way to display Hellebores. Their faces are truly lovely but their shy, nodding ways tend to hide them from view in the garden. Hi Rickii, you are so right about the hellebores hiding their little faces. Floating them makes for a quick, easy arrangement too. Oh how pretty Susie. I floated hellebores today as well. I like your idea of placing some stones in the bottom of your bowl. Wish that I had thought of that 🙂 What a shame about your daphne especially after a disappointing year last year. I hope that the flowers that you do get are extra big and colourful. Thanks Anna. I guess hellebores are proving their value in lots of gardens this winter! I appreciate the the good wishes for large and colorful flowers this year. Same for you. What a nice bit of reassurance on yet another cold day. The rocks on the bottom are a nice touch and I’m hoping one or two of the daphne blooms make it through in spite of the cold. Thanks! If the daphne rallies I’ll be sure to post an update. Perhaps it will. We may get a touch more snow this week. What a beautiful arrangement! I love the combination of different varieties in your dish – just lovely that way. Wishing you plenty of springtime after such a nasty winter! Thanks so much Amy! Spring sounds lovely. Sorry about your Daphne. 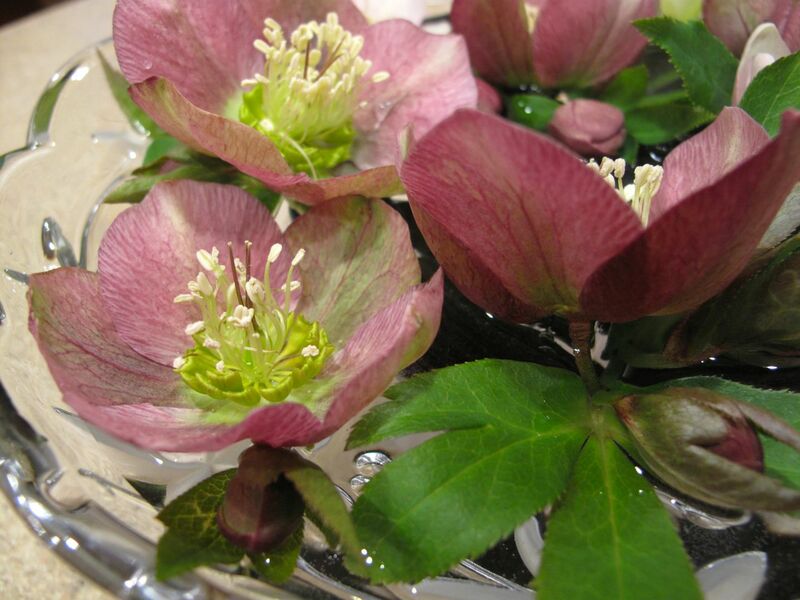 The Hellebores are lovely, I like how they make a floating bouquet. Thanks, if the Daphne doesn’t bloom I will certainly miss that wonderful scent. Hellebores have my admiration right now–such fortitude. Your hellebores are really gorgeous…I love the color variations you have. Thanks Charlie. The hellebores have been a bright spot this winter. Snowing again this morning. 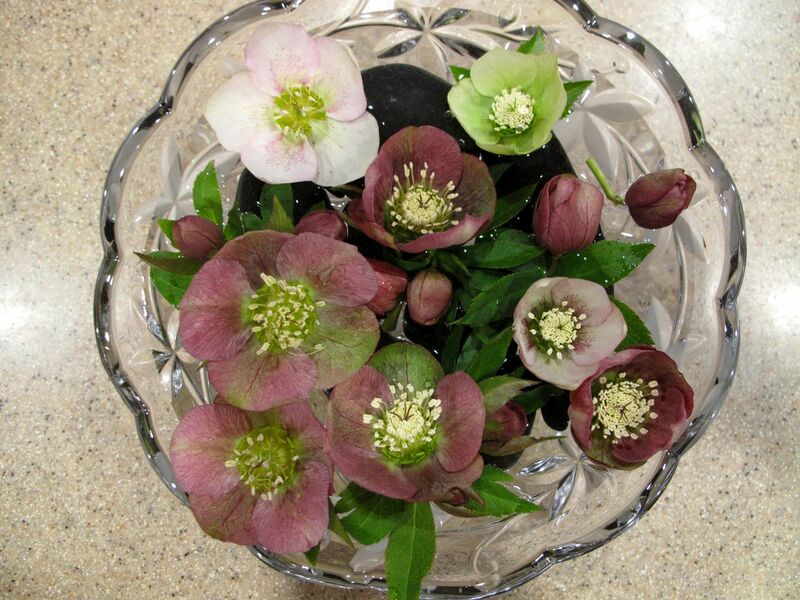 Floating hellebores is the perfect way to display them. Thank you. It would be nice to have some camellias to float this spring too. Hope this cold weather will not damage everything. Is there any possibility that you could mail these to me when you are finished with them? 🙂 I think they would cheer me up no end. Oh certainly. They’re in the mail! So sad about your Daphne. But your hellebores are looking wonderful. I think this is the best way to display them as they always wilt in a vase. Oh dear, more snow, I hope it will soon be Spring for you. 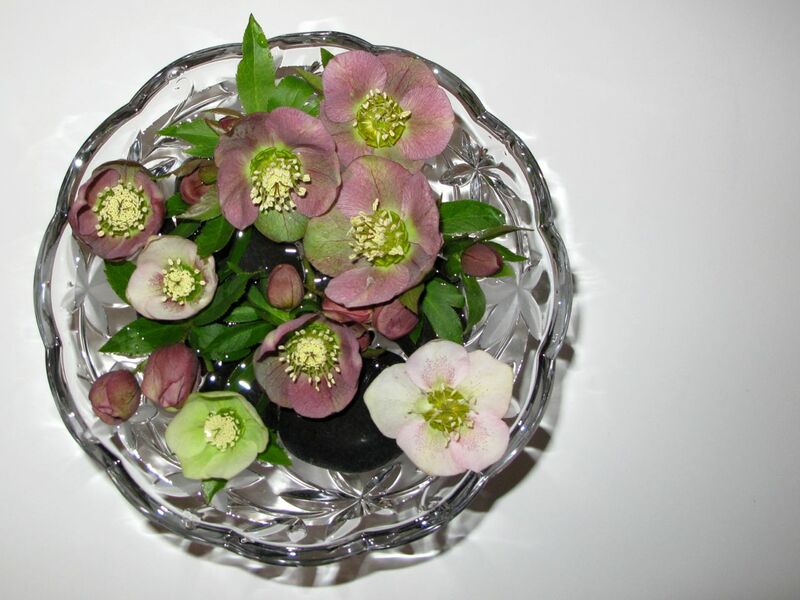 Such a beautiful bowl f hellebores – this is my favourite way to display them. I am sorry to hear that the cold weather has destroyed your daphne flowers – it is so disappointing when that happens to a special plant. Thanks Julie. The hellebores have stayed lovely floating adrift in water this week. Nice to have the color indoors. I think this is the way they last the longest – left on their stems they seem to wilt within a day or two. Lovely arrangement of hellebores. I like the addition of black stones. Lynn, thank you. The stones provided a bit of depth to this arrangement that I really enjoyed.